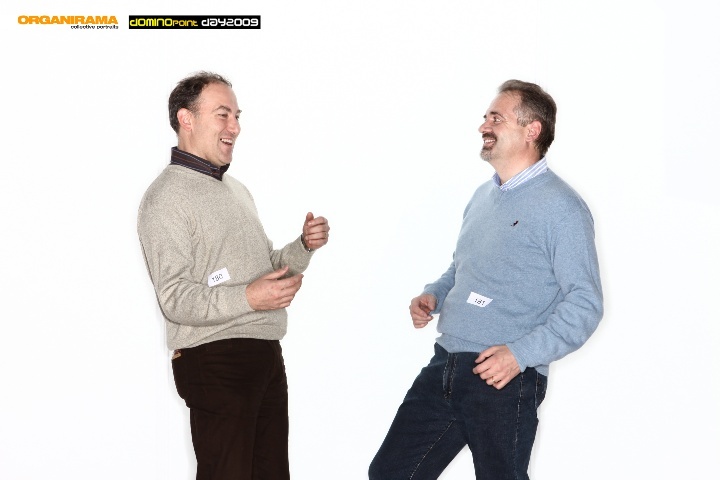 Dominopoint Day 2009: a huge success in Italy! 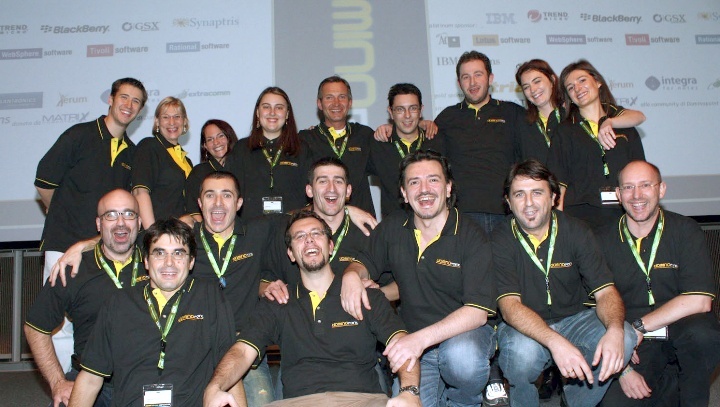 Monday, November 13th here in Italy we held our own LUG conference called Dominopoint Day 2009 (Italian site). The event was a great success, 571 people registered and a little more than 400 people actually attending, which is great, especially if you consider that it was an event in Italian, with the public almost exclusively from Italy and taking into account this period of world crisis: people there represented more than 360 Italian customers and business partners coming from all over Italy and showing a huge interest in the Lotus portfolio! The venue was IBM Forum Milano so we where into "IBM's house" (we paid for it, no special treatment!) and with over 400 persons there we where at full capacity! while working on the event in the past months, we started thinking how we can leverage the Italian Lotus community Dominopoint to help with a local "Lotus Knows" campaign; Cleis, the agency we hired to help us in the event management and Davide Pannuto of IBM Italy came up with the idea of hiring these guys of Organirama who call themselves "social photographers!" and we found a way to blend what organirama do with the needs and goals of our local "Lotus Knows" ("Lotus Sa" in Italian) campaign: build lotus awareness in a social and funny way! after each set of picture, every person has to sit in front of a notebook where they entered their contact information and had to complete the sentence "Lotus Sa", the Italian translation of "Lotus knows". Got it? Everyone is having fun, everyone looks gorgeous and these are not your standard conference pictures! Also, 'couse we're in italy, we've been able to give out a lot of IBM soccer balls, just in case the audicence was not having enough fun. 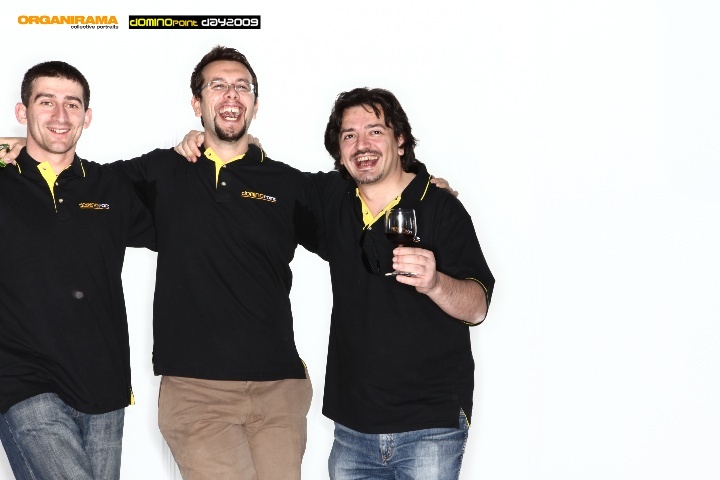 BTW, it's Dominopoint staff on the last one, from left to right: Claudio Meregalli, Daniele Grillo and Me! And what we have done with all these pictures? That's what Organirama calls a "Social Stripe" with a "Lotus Knows" sauce! (yep, Lotus knows and I know that there are some "engrish" things there, I've translated and adapted the phrases from Italian in a hurry because I was really really willing to show it, we'll fix all of them later) and the making of this "Social Stripe" is how people here in Italy got their first exposure to the global "Lotus Knows" campaign, and I'm very proud of it, as it has been made into Dominopoint Day event, with the Lotus user group event budget as an initiative coming not from IBM Italy but from the great synergy that we have here between IBM Italy and the Lotus user group Dominopoint. I am willing to bet that this stripe is going to be viral and very prominent here, I don't know how the "Lotus Knows" campaign will develop here in Italy but people will pay attention to it, because they've been part of it, of how we started it here. And, as many of you, I've been on my load of conferences in many places and in a few industries and I've never seen something so nice, funny and involving! We owe nothing to Organirama, we paid them their invoice and all, but I have to say that their work is more than excellent, so much that you should have been here to really understand. Recommended without doubt! 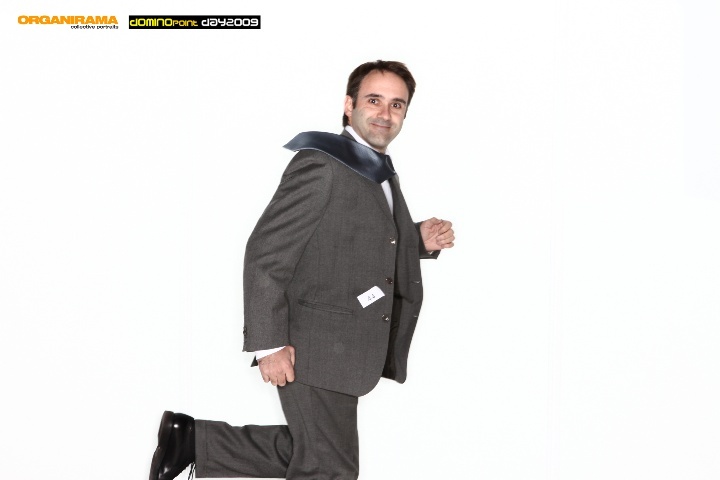 Our own event, the Dominopoint Day, is rated really high here: people called it "the only one you can't miss" or "best Italian IBM event we saw this year across all brands" up to "it's better than any Lotus marketing done YET. ever. period." regarding to the photoset and the social stripe. We owe a debt to ILUG and UKLUG people for being our model and inspiration. You'll have to trust me on this one, but sessions and speakers level is on par with ILUG and UKLUG, only everything is in Italian! Also credit for hiring Organirama has to be given to Davide Pannuto, marketing manager of IBM Italy (he always help and support us in any possible way) and to cleis, the agency that we hire to help us managing the event but the willing to do something to bootstrap the Lotus Knows campaign in Italy has come from us, from the Lotus User Group Dominopoint, and given that IBM is known to be very traditional and formal, at least here in Italy, I don't really know... or better... Lotus Knows if it was even possible to do something like that outside of a Lotus User Group event! We're very proud our conference, we feel that we've been able to do something, from the bottom, with our beloved lotus users and our passion for all things Lotus! Now, there's a comment section here, we're really interested on listening from you, for good or bad, what do you think about that? Really cool! 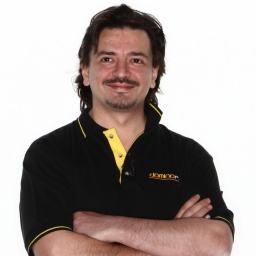 Congratulations to the 3 authors, to Davide, to the agency ... to all of us! For the experts (as Marchesano) mine pictutes was a Gyaku Tzu Chi. Congratulations for the event and for this campaign. In three years you have done terrific work promoting and growing this event. Very well done!! Congratulations on a great event, from the Netherlands Lotus User Group 'SNUG'. Excellent work guys! I really loved the Organirama pictures / slides. This keeps the Lotus spirit alive! Amazingly impressive guys. Very very well done! Congratulations on a great event and a wonderful posting after the fact! Not only did I have a great time meeting Italian customers and business partners, I had fun particpating in the Organirama pictures. Thank you fo bringing "lotus Knows" -- e.g. "Lotus Sa" to Italy! So original and fun! I want to come next year! And I hope Invia means submit!